Gruyère cheese is one of the finest, most revered cheeses in the world. 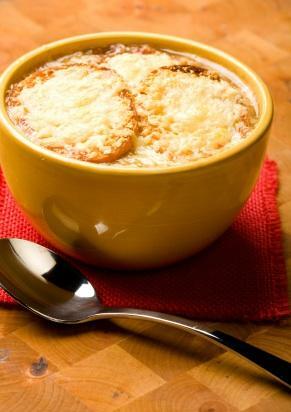 It is most well known for topping a savory, steaming bowl of French onion soup, or serving as a gooey, melty dipping sauce in traditional fondue. Most Americans have only tasted Swiss cheese, which is a cheap, and poor imitation of the true Swiss miss, Gruyère. Gruyère cheese is a hard yellow cheese that has been made in Switzerland since the 12th century. It is named after the town of Gruyère, a small medieval village that is located in the Swiss canton of Fribourg, an area north and east of Lake Geneva. This high alpine cheese became one of Europe's most well-recognized styles by the 16th century, and by the 19th century chefs throughout the Western world made it popular with the masses when they began cooking with it in dishes such as fondue. It was not until 2001, however, that Gruyère cheese gained status as an Appellation d'Origine Controlée, a French certification granted to certain agricultural products under the government. This status means that the production and maturation is defined in Swiss law and all Guyère producers must follow strict rules and guidelines when crafting the cheese. When making Gruyère, raw cow's milk is heated to 93 degrees F and then curdled with rennet. The curds are cut into pieces the size of a grain of rice and the whey is drained. Then the curds are placed into molds and pressed. The whole cheese molds are salted in brine and then the wheels are ripened for two months on wooden boards. Further curing, up to ten months, creates a more intense flavor. The AOC designation requires that Gruyère must be aged in cellars with a climate that is as close as possible to a natural cave. The humidity should be between 94 and 98 percent, because this determines the texture of the final product. The temperature of the caves should be between 55 and 57 degrees F.
The resulting cheese is full of intense flavor that is sweet and slightly salty. When young, it has a pronounced nutty, creamy profile, and as it ages it becomes more bold and earthy with undertones of fruit and nuts. Le Gruyère Premier Cru have many different varieties according to how aged the cheese is. The following age profiles are what to look for when purchasing this cheese. In Switzerland there are more age profiles including surchoix, vieux, sale, and grotte. A few tiny holes, usually no larger than a pea, are the result of propionic acid bacteria which give the cheese a distinctive acid taste and form bubbles of gas. Depending on how, and the degree to which, the cheese is pressed will determine how big the holes are. For example, in Swiss Emmental, the holes are quite large. Because of its longer aging, its cream content and its dense texture, Gruyère is ideal for melting because the result is soft and creamy. Consider using it for grilled cheese, as a topping for soups, in quiche, or in a traditional chicken cordon bleu. If you are interested in making fondue, use it with a combination of Emmenntal and Appenzeller, or Comte, as it will impart a beautiful silky texture to the pot. Gruyère is also a superb eating cheese, which pairs well with apples, pears, or simply by itself with a few slices of good, crusty French baguette. White wines, such as riesling, red or white Burgundy, or a sparking apple cider go well with this cheese, as does a bock beer. When purchasing Gruyère, it is ideal to purchase your piece from a whole wheel, rather than buying it pre-cut and wrapped. Anything that shows surface mold or pooled butterfat should be avoided. A true AOC Gruyère has "Switzerland" stamped in red all over the flat faces of the wheels. Other imitations will not have this marking, so be sure to look for it when purchasing. Gruyère is the only cheese that has won the title of "Best Cheese in the World" at the World Cheese Awards in London three separate times: 1992, 2002, and 2005. This is an impressive feat considering how many cheeses there are to choose from.